Sweets is quite possible to cook at home. A few minutes of free time and get a treat without preservatives and dyes. For example, Apple pastila. Home to do such a sweetness very simple. Start cooking the candy home with soaking agar. Pour the agar water and wait until it swells. In the meantime, bake the apples in the microwave until soft, you will need about 4-5 minutes. Have ready the apples with a spoon select the pulp and beat with a blender until homogeneous puree. 250 g of Apple pulp for homemade marshmallows take 250 g of sugar and vanilla to taste. Mix everything well and place in refrigerator until cool. Prepare Apple candy on. Swollen agar-agar heat to dissolve. Sprinkle in 150g sugar and wait until it clears. At the same time, keep the weight at a slow fire, then remove. Take the cooled mashed apples to marshmallows, add whites and beat with a mixer at maximum speed. Get white thick mass. Turn mixer on small speed and a thin stream pour the hot agar-agar with sugar. Pour the sweet pulp for homemade Apple pastille in shape, covered with a film, a layer not more than 2 cm in height, smooth the surface and leave to harden. After 5-6 hours of Apple candy at home ready. Sprinkle it with powdered sugar, flip it, remove the foil and sprinkle over a little. Cut into wedges, well, roll them in powdered sugar, dry candy 6 hours and you can eat. 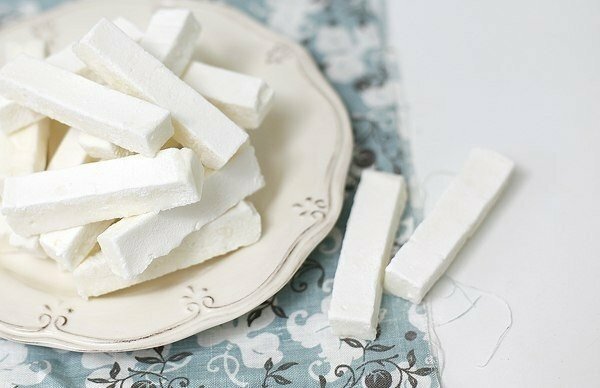 Try to keep the agar-agar doesn't burn, otherwise the taste of homemade marshmallows would be ruined. To prepare candy at home can be not only apples, recipe pastes can be changed to your preference, for example, add pears, bananas, peaches, and so forth.